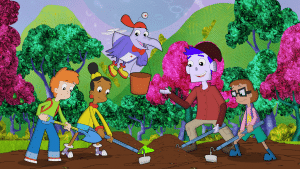 There’s a lot happening in the world of Cyberchase this spring… time travel, citizen science, and an invasive funky flower just to start! Cyberchase fans won’t want to miss five brand-new episodes coming to CPTV Kids’ Saturday morning lineup — and premiering just in time for Earth Day 2018! Cyberchase is an Emmy Award-winning children’s series featuring a group of heroes who go on thrilling adventures, each driven by a different math concept. The series airs on CPTV Saturdays at 8:30 a.m. New episodes kick off on April 21 — the day before Earth Day. That’s good timing, since the new episodes will feature environmental themes and topics, including green roofs, invasive species, water conservation, and more! “Housewarming Party” – Airing Saturday, April 21 at 8:30 a.m. In Happily Ever Afterville, the Three Pigs have just finished building their new cottage at the base of Mount Evermore – a peaceful spot without any direct sunlight. They are celebrating with a housewarming party, and they’ve hired Jackie as their party planner! But trouble strikes when Hacker and Wicked accidentally zap Mount Evermore away. Now, the sun is streaming directly onto the pigs’ house, and it is quickly heating it up inside! Can the CyberSquad cool down the pigs’ warming house and save their housewarming party? 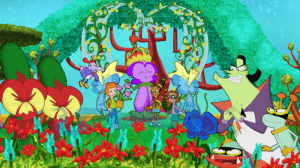 “Invasion of the Funky Flower” – Airing Saturday, April 28 at 8:30 a.m.
Contestants from all over Cyberspace have come to Gardenia, a gorgeous garden cybersite, for its annual flower-growing contest. Hacker is sure his doofydill will win Tallest Flower, but when he loses, he is furious. He flies to a faraway site and brings back a funky flower – an invasive species! The flower emits a stinky odor that no one can handle. Worse, it spreads quickly, steals water, hoards sunlight, and crowds out the native plants! The CyberSquad races against time to find ways to stop the funky flower. “A Renewable Hope” – Airing Saturday, May 5 at 8:30 a.m.
Hacker has finally captured those Earth brats on the Wreaker! Before he can decide what to do next, an alarm goes off… the Wreaker is out of fuel! He lands on the nearest cybersite, Ekardia, an eerie place with no one in sight. He and the Cyber Squad find just one Ekardian left behind – Ted. Everyone else left because Ekardia ran out of frixite, the nonrenewable resource they used to power everything. If Hacker and the kids are going to get home, they and their new friend will need to learn from Ekardia’s past. Can they also help save its future? “The Migration Situation” – Airing Saturday, May 12 at 8:30 a.m.
Bird lovers have arrived at the Migration Celebration, a magical event where the rare teal-footed trillers flock once every five years. But when the trillers are a no-show, Professor Bobson, host of the celebration, knows something is amiss. After he cancels the event, people start reporting triller sightings all over Cyberspace! The Professor and the kids recruit citizen scientists to record their observations when they see a triller. But in the chaos, they forget that Digit, the biggest triller lover of all, can be a big help. When all the citizen scientists have reported back, it leads to a shocking discovery. What is the data telling them? And can Digit help crack the case? “Back to Canalia’s Future” – Airing Saturday, May 19 at 8:30 a.m.
Digit’s friend Pearl says her town is in trouble. The water levels in Canalia, a cybersite connected by canals, keep getting lower, but the Canalians don’t see a problem. So Pearl built a time machine to prove she’s right! She travels with the CyberSquad into the past to see how much higher the water levels were, and the kids promise to help convince Canalians to change their water-wasting ways. But when they invite everyone to travel through time and see what happens, the time machine goes missing! Hacker has stolen it! Can the kids get the time machine back? And can Canalians be convinced to protect their future by changing the present?